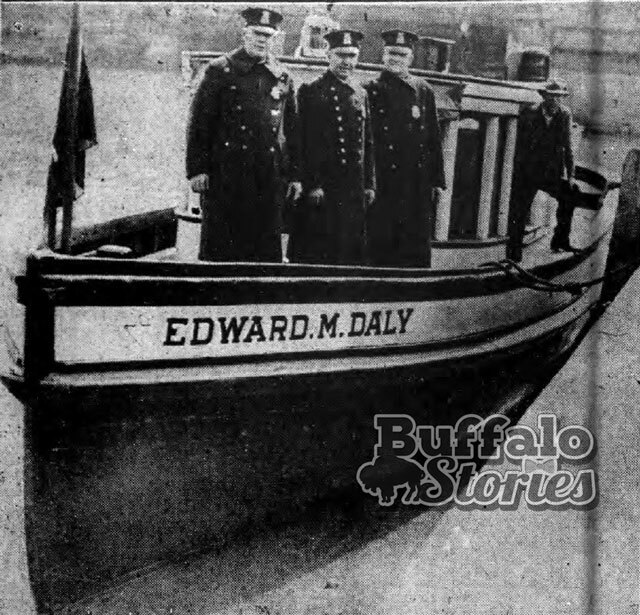 Called “the guardian of the waterfront,” the Edward M. Daly was Buffalo’s police boat from 1921 to 1936. The craft was named after a Buffalo patrolman who enlisted in the Navy during World War I. He was lost at sea when German U-boats torpedoed the transport ship USS President Lincoln off the Irish coast in 1918. The Daly was stationed at various times at the foot of Ferry Street or the foot of Amherst Street, and one of its primary tasks was watching the international border for motorboats trying to smuggle rum and ale into the United States during Prohibition. In 1930, Patrolmen Timothy J. Meegan, James McCarthy, Thomas J. Thompson and John Galvin were among the 10 officers assigned to the Daly. With a gasoline engine and wooden construction, the Daly’s top speed of 11 miles an hour made it obsolete by 1936 when Commissioner James Higgins sold it for $415, with the proceeds going toward the purchase of a newer, faster boat — to be used only when needed, not on regular patrol.